We’ve just returned from two weeks enjoying Norway. It will take months to sort through and edit approximately eight thousand photos (not including the Bad Cellphone Photos™…). 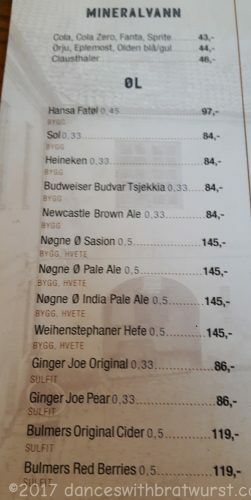 One fun thing about living in Freising is that we can find beer brewed two miles from our home just about everywhere…here is a beer list from a café in Oslo. With the prices, so you can compare the various imports and Coca-Cola. Last weekend was also the annual Weihenstephaner Bergfest, where the brewery invites people to enjoy their product on site at a reduced rate, along with music, food, and most importantly a bounce house (Hupfberg) for the kids. 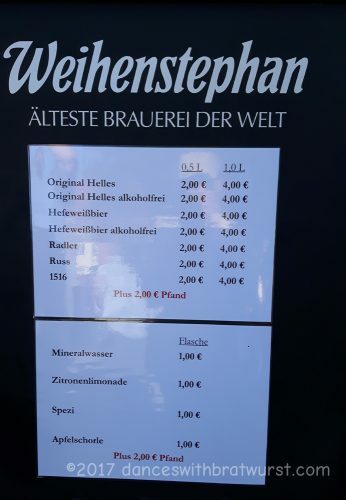 Cheapest beer in Freising, one day only! It’s a seriously reduced rate; the same beer will be approximately 7,80€ for 1L next month at the Volksfest.